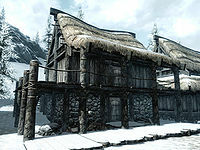 Dawnstar Barracks is the living quarters for the Dawnstar guards. It also houses Dawnstar's jail. It is located between Windpeak Inn and The White Hall. It is a two-story building with an upper balcony and direct access via a flight of stairs at the rear of the property. 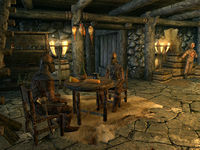 It consists of two areas: Dawnstar Barracks and Dawnstar Jail. The ground floor consists of an area for the guards to sit and relax, with access to the top floor via a flight of stairs against the east wall and to the jail via stairs down to the basement via a flight of stairs in the middle of the south wall. Under the stairs to the east are several barrels, including two containing foodstuffs. To the left of the stairs down to the jail is a set of shelves holding five bottles of alto wine, three bottles of wine and three common books, with a food barrel to the right and a rack hanging from the ceiling holding four pheasants. To the right of the stairs down is a row of straw bales that continue around and along half of the west wall. There are two practice dummies set up in front of these. In the northwest corner are two food barrels with a potion of minor healing and a potion of plentiful stamina on top. Against the north wall is a dresser holding a steel sword, an iron mace, two bottles of Nord mead, and three iron arrows. In the middle of the room is a round wooden table and two chairs. On the table is a loaf of bread, a bottle of wine and a goat cheese wedge. The top floor is a sleeping area for the guards off duty. Above the stairs are two food barrels with two bottles of Nord mead on top. There are three single owned beds. The first is coming out from the middle of the south wall, the second is in the southwestern corner against the west wall, and both have chests (both of which are non-respawning, unlocked, and contain leveled items) at the foot of them. On the floor, to the right of the first bed are two bottles of Nord mead and a common book. The third bed is in the northwestern corner against the west wall, with another non-respawning unlocked chest containing leveled items to the right of it. The door out onto the balcony is in the middle of the north wall, with a round table and two chairs to the right of it. On the table is a bottle of alto wine and five loose coins. Entering the basement, the room is split lengthwise, with a single large cell behind an adept-locked jail door in the rear half of the room. There are barrels, crates, and sacks throughout the basement mostly containing foodstuffs. The east end of the room is partially screened behind wooden walls, beyond which are more barrels and a long wooden table holding two bottles of alto wine and one of wine, two loaves of bread, two sweet rolls, several pieces of cheese, an apple pie, and several green and red apples. To the right of the entrance is a large vat and a pile of firewood. The west wall has more bales of straw against it. 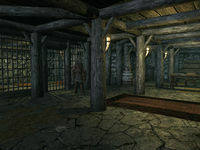 To the right of the cell, against the south wall, are the evidence and personal belongings chests next to each other and in the middle of this part of the jail is a long wooden table holding a bottle of alto wine, a bottle of wine, a common book, and a copy of the key to Dawnstar Jail. The cell contains three bed rolls, as well as a copy of the Lockpicking skill book The Wolf Queen, v1 partially hidden behind a pillar in the southwestern corner. This book is not classed as owned, so you are free to take it. This page was last modified on 6 October 2016, at 08:59.